Although geared for business, the free Lite version of SlideRocket is ideal for education. Students & teachers will find inspiration from the gallery of sample presentations and creative themes and can easily enhance their presentations with the intuitive tools for adding graphics, transitions, and music. You can easily import an existing PowerPoint to SlideRocket, and of course, view it on your computer, iPad, or iPhone. Prezi is ideal for visual learners or anyone seeking to create a unique presentation. With its “zoomable” canvas, “zebra” editing tools, and navigational paths, Prezi is fun and easy to use, and a powerful tool for cloud-based presentations. I really like that there is an educational version, which promotes sharing and reusing presentations and provides a forum for inspiration and learning in an educationally-appropriate community. There are articles,lessons, and forums for educators and students to explore and share. I have been amazed by how creative students can be when allowed to create their own Prezis. Here’s my own Prezi (not nearly as imaginative as what a typical 6th-grader can do) about technology at Blanchard. You can view Prezis anywhere, including with the free iPad app. If you are still loyal to PowerPoint but want to be mobile, you can download the SlideShark iPad app, upload PowerPoint files for free, and view and share your presentations on an iPad. Most features, including graphics, colors, and animations transfer with SlideShark, making it a must-have app for anyone using PowerPoint and an iPad. 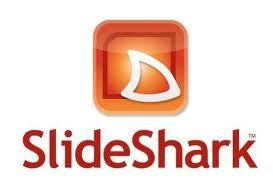 Another option for sharing PowerPoint slides across any platform and with any device is SlideShare. While some features, including animations and transitions, may be compromised, SlideShare is a simple solution to the dilemma of students using software or devices at home that are incompatible with school computers. Simply upload files from PowerPoint, Keynote, Open Office, or even documents and videos, and your files will be in the cloud, easily accessible and available for sharing.